The premium compact crossover class is really starting to boom as of late. BMW’s already onto its second generation of the X1, and Mercedes-Benz is now riding that bandwagon through the GLA. 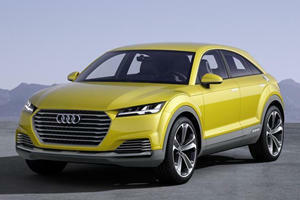 No surprises, then, that Audi’s followed up with its own entry in this segment, via the Q3. Also unsurprisingly, the Audi Q3 compares favourably well with its upmarket competitors – a nice interior, good practicality and strong residual values are par for the course here, as they are on the BMW and Mercedes. 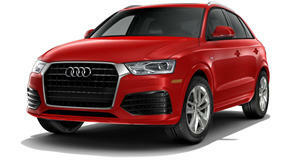 Those almost-identical attributes do also manifest themselves in the Audi Q3’s drawbacks, however. Every single material you’ll find in this cabin are of the highest grade you’ll find in the compact crossover segment. Audi has a reputation for building some of the best car interiors you’ll find this in their respective classes, and the Q3 is no exception to this ruling. Every single material you’ll find in this cabin are of the highest grade you’ll find in the compact crossover segment, and everything feels solidly put together. It’s very impressive stuff, and certainly helps justify the price premium you pay over more mainstream rivals like the Buick Encore or Mazda CX-3. If we do have a criticism with the quality of the cabin, it’s that the overall design and control layout is getting a bit dated now – especially when compared with more modern Audi models fitted with the firm’s latest infotainment and multimedia interface technology. That said, bar the slightly fiddly rotary dial on the center console that controls the 6.5inch display, all of the controls are intuitive to use on the move, and the crisp resolution makes the screen easier to read when, say, you’re quickly glancing at it whilst driving. You also get 60:40 split-folding rear seats as standard on the Audi Q3. Rear practicality is also alright, with good head and leg room all round and lots of good-sized storage spots dotted about the place, with the door bins and compartments in the center front armrest getting the thumbs up from us. As with quite a few crossovers in this segment, though, the middle rear seat isn’t that wide, so do bear that in mind if adults will be mainly using the rear seats. Trunk space is also pretty good, if not exemplary for this class. At 16.7 cubic feet, it’s comprehensively pipped by the Fiat 500X’s 18 cubic feet capacity, but you can find small SUVs with even tinier trunks that that (we’re looking at the Nissan Juke in particular here), and the combination of a boxy shape, a wide opening and a shallow trunk lip means it can gobble up larger and more cumbersome items with relative ease. You also get 60:40 split-folding rear seats as standard on the Audi Q3, so you can extend the load bay even further if you have even larger items to lug about. Plus, the seat backs fold away completely flat and flush with the trunk floor, so sliding heavier gear in and out should be a doddle here. Anyone jumping out of the previous generation Audi A4 into a Q3 will feel right at home in here. A tall crossover was never going to be the sharpest car in the world to drive, so Audi’s gone down the more comfort-oriented route with the Q3’s driving dynamics. 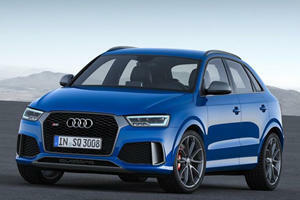 Even though a reworked version of the Volkswagen Golf GTI’s engine has found its way under the hood, the Audi Q3 never truly exhibits the sporting verve and pizzazz of its VW hot hatch first cousin – so, if it’s fin behind the wheel that you’re after, a BMW X1 or Mercedes-Benz GLA will be a much more suitable car for you. That’s not to say it’s an awful car to drive, though. In fact, in many ways, the Audi Q3 is quite a pleasant vehicle to pilot down the road, thanks to direct steering, good forward visibility, well-contained body lean in the bends and surprisingly high levels of grip that belie the norm for such a tall car. Anyone jumping out of the previous generation Audi A4 into a Q3 will feel right at home in here. Where the Audi Q3 properly starts to impress, though, is when you get it out on the open road. The suspension that does such a good job of controlling the car’s mass in the corners is also very capable at ironing out all but the most rutted of road conditions you’ll come across in day-to-day driving, and easily shames the bouncier ride quality tendencies of the BMW X1. If you regularly spend your driving time on more open stretches of road, the Audi Q3 will make an awful lot of sense to you. Another way the Audi shows the BMW a thing or two about highway manners is with regards to noise insulation. Whilst the engine can be a bit grumbly at times, road and tire roar are remarkably well suppressed at higher speeds, in spite of the bluff bodywork and large alloy wheels. If you regularly spend your driving time on more open stretches of road, the Audi Q3 will make an awful lot of sense to you. There is, however, one drawback with the Audi Q3: rear visibility. Due to the slim rear window and chunky rear posts, it is quite hard to accurately see where the back of the car is, and those thick posts do result in rather big over-the-shoulder blind spots. We will let Audi off a little bit on the rear window, though, as all Q3 models get a rear parking camera as standard. It’s good news, then, that the engine itself isn’t too bad. 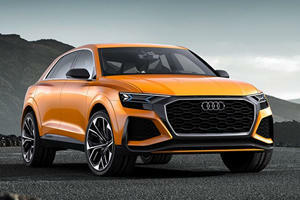 Turbocharged four-cylinder gasoline engines are the name of the game in the compact crossover market nowadays, and the Audi Q3 is no exception. What’s not as normal, though, is being restricted to just one engine option – as is the case here. It’s good news, then, that the engine itself isn’t too bad. Though this 2.0-liter engine does look a bit weedy on paper in comparison with the punchier alternatives in the BMW X1 and Mercedes-Benz GLA, the 200hp and 207lb/ft of torque are ample enough to get this crossover up to a decent lick of speed. Plus, the six-speed automatic transmission does change gears smoothly and swiftly, so any limitations the Audi Q3 does have in comparison with its rivals isn’t hindered further by gear-change-interrupted lulls in acceleration. Running costs are also pretty disappointing by class standards. That torque output is also available across most of the mid-range, so you don’t need to be flooring the gas pedal in order to maintain the pace. Which is good, as the Audi Q3’s engine is surprisingly coarse for a Volkswagen Group motor, with a mildly grumbly idle and a dull-ish drone when you enter the higher rev band. Even when factoring in the Audi Q3’s higher curb weight, it’s bizarre to see such characteristics in an engine that’s loosely related to the Golf GTI’s free-revving peach of a power plant. Running costs are also pretty disappointing by class standards, with Audi claiming an above-average 20/28mpg in the city and on the highway respectively. In contrast, a Mercedes-Benz GLA with a comparable 2.0-liter turbocharged four-cylinder gasoline engine can return 25mpg and 35 mpg respectively, with the BMW X1 also being able to return over 30mpg on the highway. As with every other premium compact crossover, though, there is one big issue holding the car back: it’s price tag. Everything so far seems pretty good about the Audi Q3, bar a few drawbacks and quibbles here and there. As with every other premium compact crossover, though, there is one big issue holding the car back: it’s price tag. With a starting price of $33,700, the Audi Q3 is already quite expensive for a car of this size – especially when you can pick up a similarly-sized Mazda CX-3 (one of our favourite cars in this class, no less) for $19,960. Yet, at this price, the Audi Q3 is unusually devoid of quite a few features in its entry level guise, with gubbins like a powered tailgate, built-in navigation and even gearbox paddle shifters for the automatic transmission coming in as optional extras on the most basic ‘Premium’ trim. Thankfully, unlike the BMW X1, you don’t need to sink loads more money into an Audi Q3 to get it to a nice spec, thanks to a surprisingly-generous-by-premium-SUV-standards standard equipment list. Even if you stick with the most basic Audi Q3 you can buy, you’ll still have a crossover fitted out with leather upholstery, heated front seats, climate control, hill descent assist, cruise control, a power sunroof and a reversing camera with all-round parking sensors as standard. Not bad, considering many of these features are actually options on the BMW X1 and Mercedes-Benz GLA. We do advise, though, that you stay away from the optional all-wheel drive system and the top-tier Prestige trim. Also surprisingly, the options we mentioned earlier are pretty much the only add-ons you get spec on your Audi Q3 (usually, Audis have ridiculously large options lists). Therefore, it makes our job of recommending which options to go for really easy – bar the $2,600 Technology Package, which throws in satellite navigation and a blind spot warning system, you don’t really need anything else (unless you want a power tailgate and shifter paddles behind the steering wheel, which will put you back another $400 and $550 respectively). We do advise, though, that you stay away from the optional all-wheel drive system and the top-tier Prestige trim, as they bump up the Audi Q3’s already steep price to ‘oh my God, I can get a far more practical Land Rover Discovery Sport for the same money’ levels of expensiveness. Adding all-wheel drive also means you’ll lug more weight around in the car, thus impacting the fuel economy and ride/handling balance, so keep that feature off your Q3 unless you’ll genuinely need the extra traction such a system provides you. As if the SUV market isn't already saturated enough. Set to rival the likes of the Range Rover Evoque and BMW X2.